Locations where you can find Snap Seeds and what they're used for in Sekiro: Shadows Die Twice. In Sekiro: Shadows Die Twice, there are a variety of different consumable items you can find and use in the game, including Snap Seeds. When battling certain enemies and bosses, it can be helpful to consume Snap Seeds as they will help you in combat against apparitions and illusions. Struggling to find Snap Seeds? We’ve got you covered! Below, we’ve put together a quick guide on where you can find Snap Seeds in Sekiro: Shadows Die Twice. Snap Seeds can be collected in locations including Sunken Valley Passage, and are used to combat apparitions and illusions in Sekiro: Shadows Die Twice. As noted above, Snap Seeds are a consumable Quick Item that can be picked up in various locations throughout Sekiro: Shadows Die Twice and are used to help in combat against enemies, including apparitions and illusions. There are several locations and activities in Sekiro: Shadows Die Twice that let you stock up on Snap Seeds. Below, we’ve listed all of the ways we’ve earned Snap Seeds in Sekiro: Shadows Die Twice. Hirata Estate: You’ll receive 1 Snap Seed from an NPC named Inosuke before you fight Lady Butterfly. 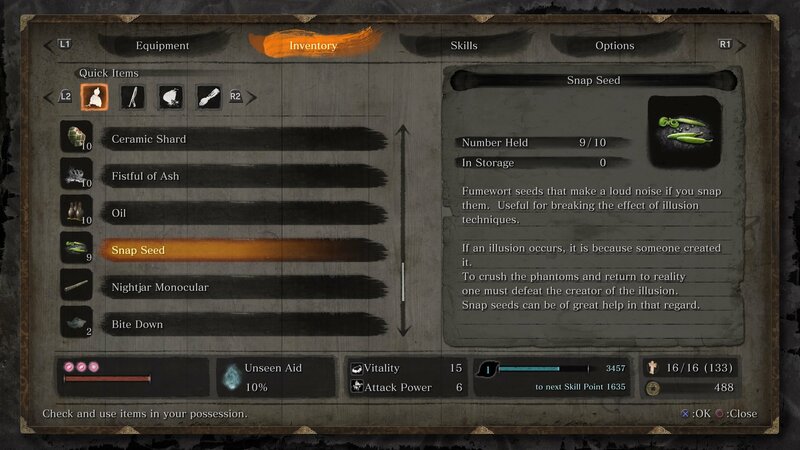 Ashina Outskirts: You’ll receive 5 Snap Seeds from the item near the place where you defeat the Great Serpent by stabbing it in the eye. Ashina Depths: Snap Seeds can be found in one of the walls in the Mist Noble room. Sunken Valley: You can pick up 3 Snap Seeds near the Gun Fort Idol, on top of the wooden platform in the room with the heavy gunner enemies. Sunken Valley Passage: Shortly after the Riven Cave idol you can pick up 3 Snap Seeds near a Monkey that appears to be praying to them. Sunken Valley Passage: You can pick up another Snap Seed near the Toxic Memorial Mob merchant. Vendors: After you defeat the True Corrupted Monk boss you’ll earn the Dragon Table Key which gives you the ability to purchase Snap Seeds from all vendors in Sekiro: Shadows Die Twice. Snap Seeds are primarily used to combat apparitions and illusions, though they’re also recommended for certain boss fights. For example, you’ll want to consume Snap Seeds prior to taking on Lady Butterfly and prior to your fight against the Corrupted Monk located in Mibu Village. For a great spot to farm Snap Seeds in Sekiro: Shadows Die Twice, be sure to check out the helpful video below courtesy of YouTube user No Touch Throw. Now that you know where to get Snap Seeds and what they’re used for in Sekiro: Shadows Die Twice, be sure to check out some of our other guides including all Treasure Carp Scale locations in Sekiro: Shadows Die Twice, how to dive underwater in Sekiro: Shadows Die Twice, and where to find Sabimaru in Sekiro: Shadows Die Twice.